The MicroMax VIM LED Driver features a Edison plug input and barrel plug output. The units allow full-capacity output that enables users to power lighting at full load without derating power supply. 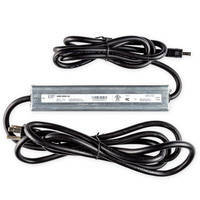 The product is UL Listed and meets the standards of Class 2 installations. It is offered with 179 mm x 33.3 mm x 24.1 mm dimensions and provides 24 VDC - 90W full-capacity output. SAN DIEGO, Jan. 22, 2019 /PRNewswire/ -- Environmental Lights, a leader in LED lighting solutions, and ERP Power LLC (ERP), a leading provider of small, smart and connected LED drivers for the lighting industry, introduced the new MicroMax VIM LED Driver. The MicroMax VIM is the result of a collaboration combining Environmental Lights' extensive lighting engineering experience with ERP's innovative LED driver technology in order to create a robust and compact LED driver that simplifies installations and maximizes the amount of power you can use on UL Class 2 standard. The drivers feature full-capacity output with an Edison plug input and barrel plug output for plug-and-play connectivity. "We look forward to partnering with ERP for the launch of the new MicroMax VIM drivers, which are ideal for LED installations where usability and simplicity are crucial," stated Jordan Brooks, President of Environmental Lights. "Together with Environmental Lights, we are redefining what small and powerful means in the LED lighting industry," said Jeffrey Frank, CEO of ERP Power. "Using a standard plug for AC input and standard connector for DC output dramatically simplifies and cost-effectively accelerates the deployment of cove lighting, silicone edge graphics, and other Class 2 lighting installations." MicroMax VIM power supplies are compact, but they pack a powerful punch. High-quality engineering allows full-capacity output so users can power lighting at full load without derating the power supply. The MicroMax VIM drivers are designed with the smallest size constraints in mind, so they can be placed inside coves, light fixtures or SEG frames. They are UL Listed to meet the rigorous standards of Class 2 installations. MicroMax VIM drivers are available exclusively on EnvironmentalLights.com or by calling 888-880-1880. Environmental Lights was founded in 2006 in San Diego, California, and has been listed on the Inc. 5000 as one of the fastest-growing private companies in America for six years in a row. We transform environments with LED lighting technology by engineering our customers' visions into innovative solutions. We partner with our customers from project inception, through planning, specification and installation of their LED lighting systems to ensure we create solutions that match their exact needs. Our work transforms environments in an array of industries including retail display, entertainment, trade show/exhibit, hospitality and casino gaming. Peak and Hold PWM Driver suits solenoid power save applications. Half-Bridge Gate Driver IC features programmable dead time. MOSFET Driver supports buck or boost DC/DC converters.